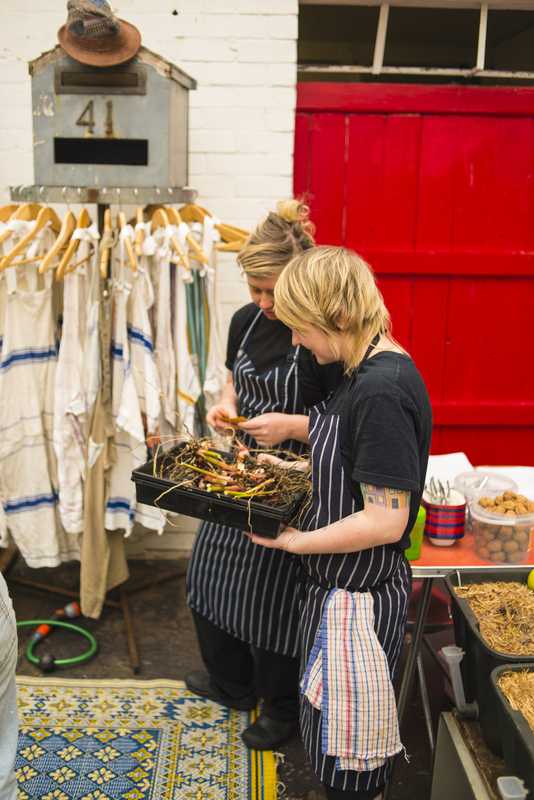 Chefs are venturing out of the kitchen and into the garden to get their hands dirty as part of Grub Food Van’s ongoing sustainability projects. 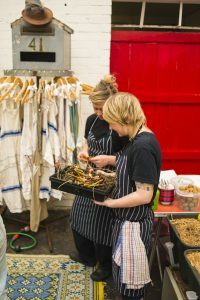 The new gardening project provides a space for Grub’s team of chefs to interact with food all the way from planting and maintaining to harvesting and cooking. 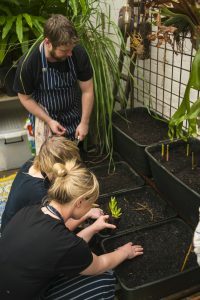 Working with Ben McMenamin from the Social Food Project, the chefs each selected a plant they are interested in learning about and using in the kitchen, and planted them at the start of spring. The Chef’s Garden contains a range of plants that are not easily accessible from regular produce suppliers, including fresh galangal, black radish, pigface (ice plant) and samphire (sea asparagus). With the assistance of Grub’s resident gardener Rhiannon Smolski, the chefs are maintaining the kitchen garden until their produce is ready to harvest. They will then each create a dish that will be added to the menu as a special, based on their ingredient and using other seasonal produce. The Chef’s Garden is an addition to the Grub Greenhouse, where the kitchen already sources much of its fresh, seasonal produce. The greenhouse surrounds also work to create a wonderful green aesthetic – and while everything is edible, not everything is eaten. All the produce in the Chef’s Garden will be utilised by kitchen staff to create beautiful new dishes for the restaurant. “I think the project teaches chefs the true value of food and how long it actually takes to grow something,” said Grub’s head chef Scott Blomfield. Eclectic and unique, Grub is at once greenhouse and dining room, garden and bar. With a commitment to the old-fashioned principles of hospitality and the newfangled possibilities found in addressing wastage and sustainability, Grub continues to grow into one of Melbourne dining’s most compelling stories.